Spicy Treats: Brown Rice Ragi Idly - Diabetic Friendly Recipes ! 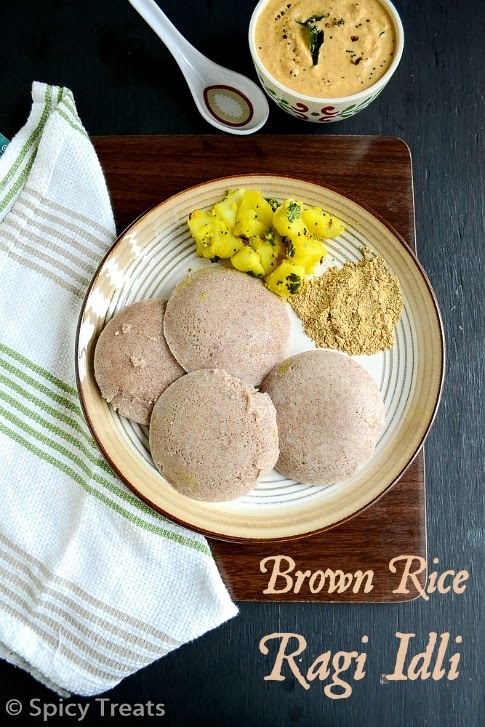 Brown Rice Ragi Idly - Diabetic Friendly Recipes ! Today wasn't in a mood to blog, my knee pain was more and not able to sit and do or concentrate on anything. I feel that i should take some break and look after my health. I was suffering with this knee pain for almost 4 years, yes i fell and got injured during my first pregnancy and that time i took Physiotherapy treatment to relieve from pain and did not diagnose the actual problem. Then after delivery with Infant and second pregnancy this and that...i did not look at my leg pain so far...Yesterday, got appointment and went to hospital and after 2 hours examination, She concluded that my knee got misalignment of ligaments and it can be cured by taking PT and made appointments till April end and hope for the good result. So till that i could not concentrate on blogging and blog hop so planning to take a short break. Ok will move to today's recipe...Day 6 of Blogging Marathon and today's whole grain recipe nothing but very easy and simple Brown Rice Ragi Idly. I planned to make stuffed idly but because of this knee pain decided to lessen my job and finished with plain idly alone. I often make idly with brown rice and this time for a change added Ragi flour to my Brown Rice Idly batter . It turned out good but compared to idly dosa came out really good. My kids loved idlis more than the dosa. Take one cup of fermented Brown rice idly batter in a bowl,add ragi flour,water and salt. Mix well and set aside for 10-15 minutes. 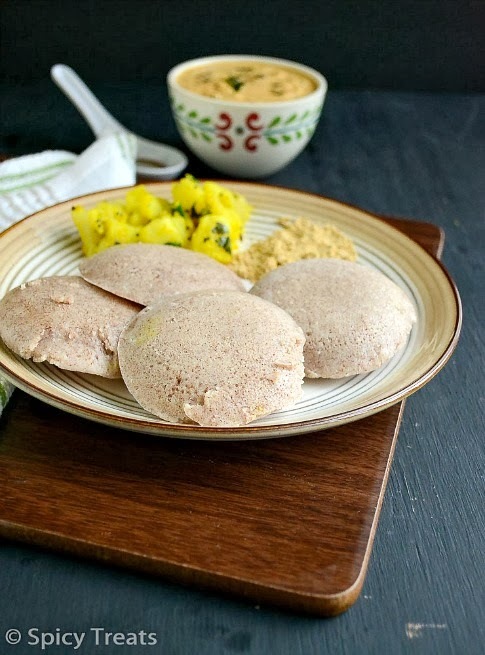 Now the soft brown rice Ragi idlis are ready to serve. Serve Hot with coconut chutney/sambar etc. I tried dosa with the same batter it also come out really good.. Such a healthy dish.Love ur presentation.. Awesome clicks. BTW Take care of your health.. Get well soon.. Thank you Divya for your lovely comment n wishes!! Take care of your health first, may be cut down on the number of posts rather than completely stopping. Looks awesome Sangee. So healthy and nutritious. The idli as well as the dosa looks so delicious. This is going on my list of "To try" recipes. Take care Sangee.. I understand it could be a real pain. Take care of yourself dear, health is wealth and rest comes next. Jayanthi is right, do posts when ever you feel better without giving stress on urself. Hey Sangee that's an awesome healthy one .. Looks really soft without any fermentation, lovely!! Take care of your health Sangee! Reduce the number of posts in your blog and probably check other blogs weekly once..everybody will understand! சுவரில்லாமல் சித்திரம் வரைய முடியாது..உடம்பைப் பாத்துக்குங்க! Take care of your healthy Sangee, I am sure After PT you will be completely alright. Take rest and do works, I have the ligament problem in the ankle as well. Me too took PT for last couple of months:( Hope you will better soon, don't worry. oh oh by the way the idli looks way too tempting and very healthy for daily routine :) Yumm !! Wow... Idly looks so tasty and very nice presentation..
First take care of your health. Blogging can wait, right? You have been whipping out such wholesome dishes which just left me drooling. These idlis look so attractive too! i used the same idli plate to steam the idli but don't come out prefectly like yours!!! Any tips to make idli fluffy & don't stick at bottom of the plate? Well fermented batter will give you fluffy idlis...and also after steaming the idlis,don't try to remove from the idly plates...sprinkly cold water over the plates n leave it cool for few minutes,then using wet spoon remove idli...keep in MW for 30 seconds n serve hot! Very healthy and breakfast recipe.. looks absolutely inviting.. Yummy !! Take care of your healthy Sangee. All else can wait. No one is going to vanish anywhere. We are all here for you. I know how much time blogging takes but you can simply cannot miss out on your health na. Awesome second click btw. get well and come back to cook more delicious and healthy stuff for us. Very healthy idlis, do take care of your health, but I'll miss you so much dear, I know it's a lot of work with this food blogging, slow down a little bit.. It is hard to accept/announce about break. But I can understand the break is required to balance life,health and work. Take care sangee. try to post atleast 2 simple recipes per week, that you can do without much effort and inturn keep your blog awake. Or leave it completely and come again with big bang of recipes. I made ragi idly once but it was a complete goof up. your's looks like soft and spongy. Like both dosa and idly. Health is very important than any thing Sangee.If ur fine means then only u can take care of ur family na. At least for that purpose take care of ur self.Blogging is always there so don't worry about that. Healthy idli's and brown rice is the one mallu's use right else which is brown rice. Sangee its better u go for knee st strengthening exercises which will give u grt relief even i hv a similar injury.. but see without blogging n stuff i do agree life cant go on.. so take good care of urself..n this is a must try recipe all ingredients in hand and am in.. Very healthy and looks so good! Take care of your health dear, our prayers r there 4 u dear...Our kids need our support, without our good health they will not at all b happy, so take rest get well soon, And regular PT as per the advice from the doctor will definitely bring the change. Healthy idly looks so soft...Take care of ur health sangee!! Take care Sangee health is important. I know you are passionate about blogging, but it is much more important to take care of one's health. So please do take care and concentrate on recovering from the knee pain, then you can come back to full time blogging. You can try a couple of MW recipes which cuts down the standing time a lot. IDLIS LUK GR8 AND HEALTHY TOO!! FIRST TIME HERE...HAPPY TO FOLLOW U...DO VISIT MY SPACE WHEN FREE!! TAKE CARE OF YOUR HEALTH SANGI. HEALTHY IDLIS, AWESOME CLICKS AND PRESENTATION. Delicious idlis and dosas. Take Care Sangeetha. Hope you are doing good now. 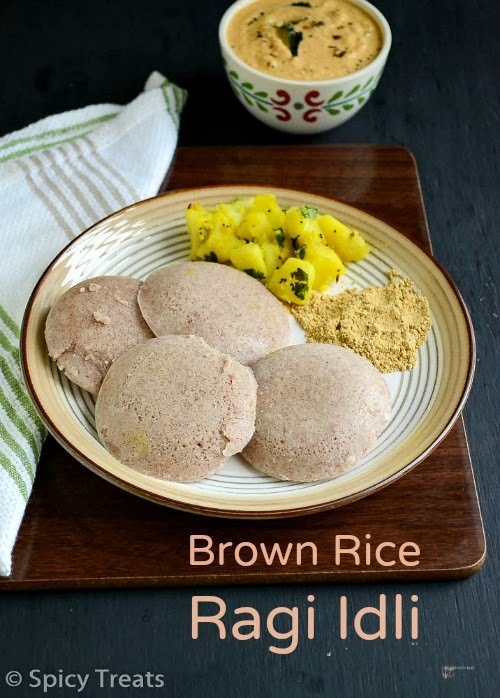 Awesome clicks of healthy idlis..
Brown rice ragi idly sounds like a wonderful substitute for regular idly. Thanks for linking it to 'Only'. I hope you are feeling better gradually. very delicious, perfect and well made idlis. Nutritious too.